Build a strong foundation in subtraction with this vast collection of worksheets, exclusively drafted for students of Grade 1 and Grade 2. 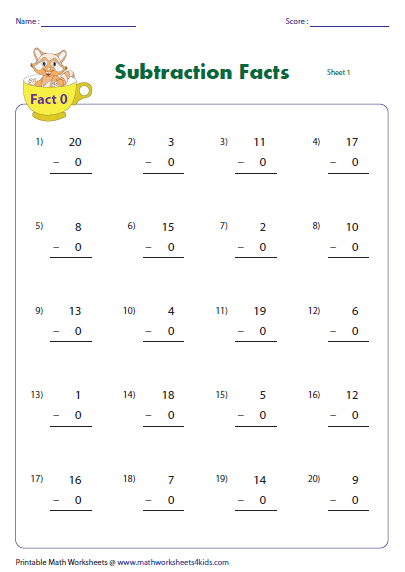 This series of worksheets contains subtraction facts from 0 through 9 in both vertical and horizontal formats. The difference between the numbers does not exceed 20. Make use of a heady mix of fun-filled theme-based subtraction facts, mixed subtraction facts and teacher templates displayed here. A few free printable worksheets are also up for grabs! 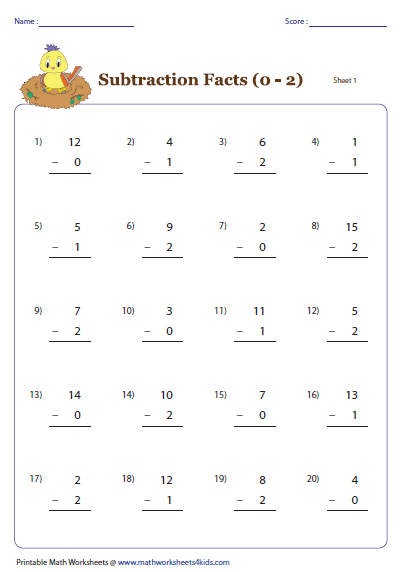 This array of column subtraction worksheets contains simple subtraction facts from 0 to 9. Answers generated will not exceed 20. This set of subtraction facts contains problems positioned in the horizontal format. 'Grab em all' to download all the PDF files in this section. This set of theme-based worksheets makes learning subtraction facts fun! 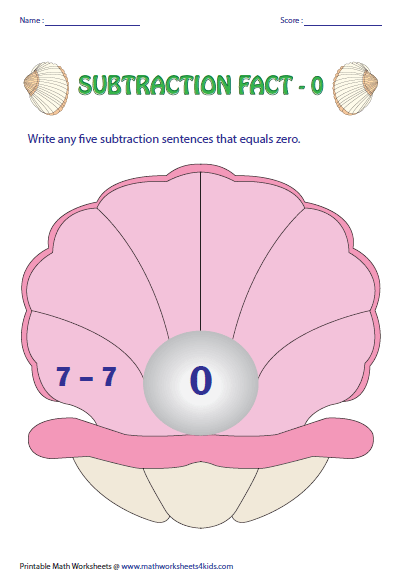 Get children to come up with five subtraction sentences to match the number (difference) displayed in the pearl. Engage kids in learning subtraction facts with this series of worksheets! 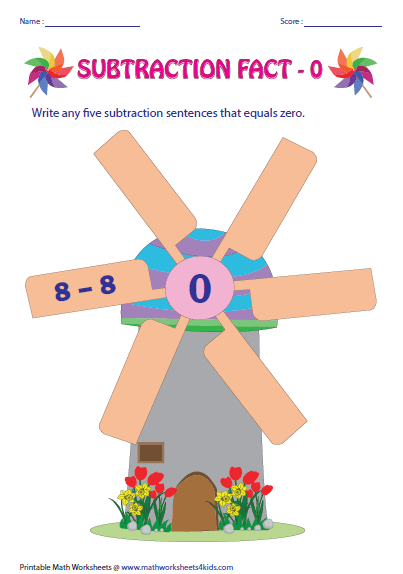 Kids should write five subtraction sentences on the blades to match the number (difference) that appears at the center of the windmill. 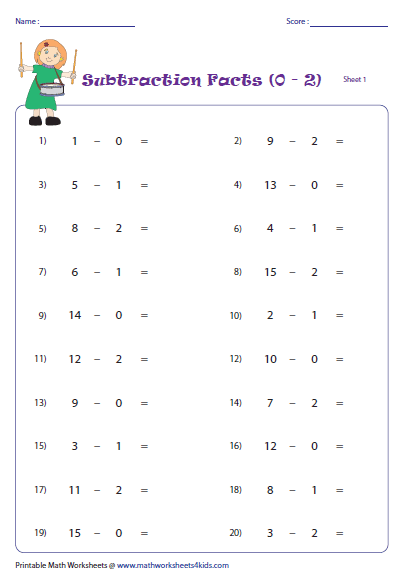 The numbers to be subtracted in this series of worksheets range from 0 to 9. The worksheets are split into a combination of different range of numbers positioned in the vertical format. A blend of subtraction facts from 0 to 9 is featured in this group of worksheets that are presented in the horizontal form. Verify the answer key to check your responses. 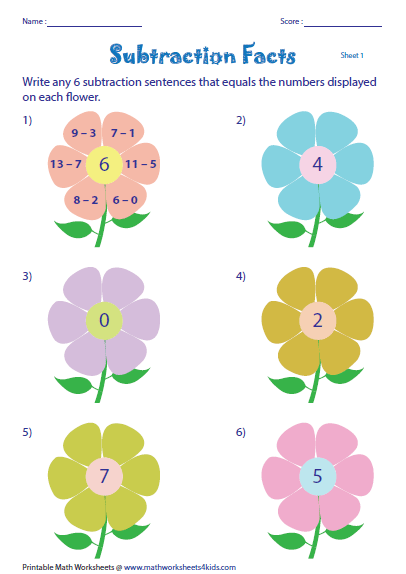 Young learners should write six subtraction sentences to match the number (difference) displayed at the center of the flower. Teacher templates in color and monochrome are up for grabs!